I wanted to use the tree as a circle in a square like a mandala. I've been looking at art by mixed media artists so I wanted to experiment and use different media and textures. In the foreground I made doves using the design I created for the doves in "Be Free" (Sunday Feb 12, 2012 on ByShi). I made them from beautiful black and purple musical manuscript papers by 'Alison Ellis Design - A Formal Affair'. For the sky around the tree I glued down text from a book I bought cheaply from a thrift shop. Then I covered this with scrunched tissue paper and then coloured it using watercolours. Then I thickened the outline in pen and added design to the sun and the trunk of the tree. I liked it as is, but as it's such a large canvas I thought it still needed a foreground. So I went ahead and added the cut out doves and outlined them in pen. I put tiny doves in the corners and added the wavy lines to the corners to give it a finished look and so the corners didn't look bare. 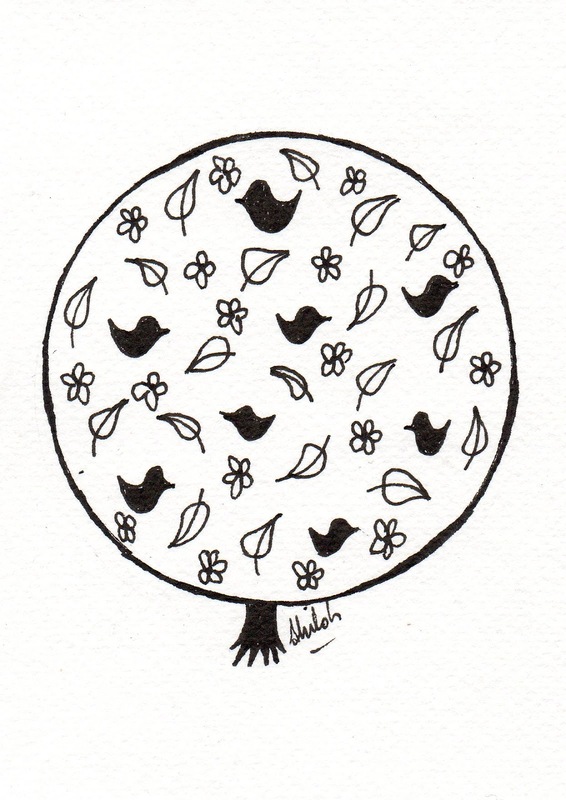 To me this symbolises peace, freedom, beauty, earthiness, nature and love. So nice to meet you through FB’s Magically Mixed Art Community.